Putting the effort into going to see this was paid back fully! Us 4 old *ahem* men met up around noon and off we go to the wilds of Bristow/Manassas or where ever the hell this place is (we drove from NC). Well, The Shriner's were loose on this one(! ), although one of our number inevitably fell to the wayside while trying recapture old glories. 25% is an acceptable loss. Roadtrips may be more fun now than ever, seeing how they come around like Halley's comet. Many great Yes bootlegs were listened to along the way. Arriving UFO: The weather is beautiful, the parking/traffic a non-issue. We're here. The less said about the opening band, the better. As The Greasy Weasel put it: "Homey, this is like getting pulled over by the cops." We flee the pavillion to imbide and people watch. Back in for the Main Event: 1st memory is Chris B saying "You know it's going to be a good rock show when the drumset gets an ovation." Then their off! GFTO: Suprise! But lawd was the mix bad. Kinda freaked me. Didn't they soundcheck? Sweet Dreams: More fader moves. I head for the head while the Sound Clown remediates. I know the best is yet to come. All Good Peeps: Getting better. Rollicking version. South Side: NOW we're talking. Mix is in! Hurt my neck from head-banging. What a heavy tune! The old-school Rick/Stevie tradefoffs at the end were fantastic! The concert has officially started. [Acst set] Hits and misses. Long Distance, Clap, Stories (stunning!) were exceptional. Swinging "Rondabout" and stale "Owner", puh-leeze! Awaken: Almost too much info at this point. Felt like I was living the end of 2001: Space Odyssey. I dug in and held on for dear life. Starship: Always one of my faves. Rocked it hard! Anderson - Was in FINE voice. Hitting everything he was looking for. Wakeman - MVP. It is NOWHERE the same without him. Still plays the old-school moogs. Loved it. Squire - 2nd hardest-working man in the biz. Vocals were dead-on. Howe - THE hardest-working man inthe biz! Dug all the tones and the elec sitar sounded great! Also did a fine vocal job. White - They wouldn't rock as hard w/o him. Very exciting player. -the guy who yelled for "Don't Kill The Whale" during the acst set, prompting Jon to comment on the "enthusiastic but somewhat confused" person. -the guy who "directed" all during "Awaken"! Good job! Thanks Yesmen for one memorable evening of music! I have been a life long Yes fan (seen shows in 77,78,80) and to be honest had not planned on going to see them on this tour. 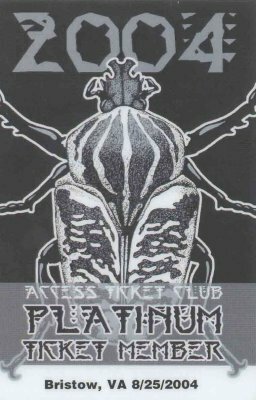 A kind person had given me a copy of the NYC show from this tour. I was blown away and I decided I had to check it out. I attended with my 10 yr old son who has now become a major Yes fan. My primary observation regarding the music is these guys can still play! The music is timeless and it does not come off as a revival show in any way. None of the band members has even a hint of "going through the motions". I did note that the set list only included material up to 1984 (Owner of a Lonely Heart) but this was my favorite Yes material. Not a marginal selection in the setlist at all!! I must admit I am not the biggest fan of the 1980s and 90s Yes material but I am learning to appreciate it more. To me the performance came off as spirited and the audience was very receptive and appreciative. Not having any other experience with other shows this tour I can't say how differently it compared. Sound quality was good, although I might be tempted to say a little low on the mix for Steve. It was not overly loud. My experiences back in 77 & 78 (MSG & Spectrum respectively) I recall the sound being incredibly loud. The visual experience of the show was great too. The Roger Dean designed set was exciting and at Nissan the band appeared to be more enveloped in the stage sculpture (like the Holmdel pictures) rather than in front of it (like MSG). The lighting on the inflatable sculptures was outstanding as well. We had terrific seats for this show right behind the orchestra , on Rick's side R & slightly raised up. Perfect sightlines for a terrific show. Why did I wait so long to see this band?? 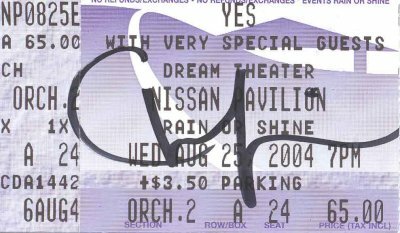 I've been a Yes fan quite a long time and this was my first show. I'm kicking myself! I admit the main reason I attended this concert was the fact that I'm a huge Dream Theater fan. And while I've been into Yes since the late 70s, have never taken the opportunity to see a show. Something I really regret now. Anywho, DT was amazing as usual. Even after seing them as many times as I have it never gets old. The setlist was perfect for the evening, performances were first rate and the crowd was most appreciative. Looking forward to the upcoming DVD out in October! What can I say about Yes? I didn't realy know what to expect. I was completely mesmerized from the first note to the last. After Awaken (possibly my new favorite song), there was a standing ovation. In fact there were several times when the crowd jumped to their feet to show their appreciation. I wasn't expecting that level of energy and excitement! Well, I could go on and on about how amazing this show was. But don't take my word for it, seeing is believing. After having seen them in Philadelphia in May, I'd have to say that that was the superior show. They were more energetic, the set list more diverse; Steve even jumped in the air during "South Side." Having said that, the show last night at Nissan had a sense of humor and a relaxed feel to it that made it very enjoyable. Some stand-outs: "Sweet Dreams," "And You And I", the crazy/cheesy flame effects during "Awaken." The acoustic set was hilarious, with Wakeman doing his vaudeville shtick during Squire's intro to "Roundabout," Anderson talking about smoking pot, White's kilt, Wakeman being wheeled off the stage while playing some old music hall tune--I hope my friend Nick gets the same kind of performance in Allentown. Thank you so much. Thank you. It�s great to be with you again tonight. How are you? Alright then, sing along. Thank you so much. Thank you. Thank you so much. Thank you. Thank you. Thank you. Thank you. Wooh! After 40 years, 30-odd years later we can still play it and we have an audience to listen to it. So, we thank you! Here�s Steve Howe on guitar! Thank you so much. Thank you. Thank you. I just remembered the ending of that song, looking for the sunshine, I always think about having a joint. Ahh, those were the days. Wooh! So now it feels like still in the days. Woohooh! We traveled all over the world, as you know. We did a song, I actually wrote this song in the morning, took it down to the studio and recorded it in the afternoon. A very rare moment, with us. And we did this in Switzerland, a song about getting up and digging the world. Love and life, things like that. Wooh! Another, other wonderous moment is ahh, in fact tonight Alan is wearing his kilt. And ahh, as you can tell, he has forgotten his sporran. But ahh, they tell me he�s going to put it on later. Sporran being the money box that�s there. You know. Over to our guest speaker for this evening, Mr. Chris Squire. Thank you. Thank you. Ahh, I must admit, you guys are very enthusiastic, very warm tonight. It�s a pleasure to play for you, and I won�t make this too long and boring. It�s just about Alan and I were in Tokyo discussing, discussing how to, how to treat the ahh, the arrangement for the acoustic version of �Roundabout�, that we put on the �Utimate Yes� 35 year collection. And thank you for buying that, we appreciate it. So ahh, we were in Tokyo, recovering from a massage and ahh, and Alan suggested that maybe if we did a kind of a, a groovy kind of a, not groovy, but more of an American, down home blues shuffle. You know, it had to be a way to go, and I said I didn�t know if it�d work. So we got to the studio in L.A. and I said to Rick, over there, because he�s our resident expert in blues shuffles, �Can you give us a really good �Roundabout� type blues shuffle?�. And he went. That, that was what he did, it was brilliant. And we decided to do it like that, and I�d also like to dedicate this to Scotland, because she deserves it, after the days we went through it. Thank you. Thank you so much. Thank you. Good to see you [??] Thank you. But Alan, Alan White right here on drums here, ahh, when he was sixteen, he was ahh, he used to play in the clubs up in the north of England. And ahh, before they played bingo, ahh, they had the band on to see first. And he used to do this wonderful paradiddle, sort of drum thing before sort of ladies would come on and take their clothes off. Or something like that. So here�s Alan doing that same striptease song. Woh! So that was it. And that wonderful paradiddle, that�s a paradiddle. In the key, that�s another paradiddle. Have you got any more? Two, two in a row. So he�s going to do a paradiddle drum break into the next song. We need you to sing the chorus with us, just to glide this song along. Here�s one for Lee Abrahams, Mr. XM radio. Thank you so much. Another wonderful evening at the North Grimsdale night club. [??] Rick �Hold That Tiger�, �Hold That Tiger�, �Hold That Tiger�, yeah. Thank you. Which leads us into ahh, this next piece of music. We always enjoy playing this next song. It�s just one of those things that ahh, makes life worth living, in many different ways. In fact ahh, as I said earlier, after so many years, we still love the idea, performing this song. So here we go. Wooh! As we drove down from Cleveland, we were in Cleveland last night, driving all the way through to this part of America. You realize how incredibly big America really is and how many different kinds of people there are all over America. And ahh, I was driving with my beautiful wife, Jane and just had the most wonderful time, realizing Jane was born here, a few miles from here. And ahh, it�s just amazing to travel and enjoy. Soul companion, this song is for you. The idea that we are awakening to a most amazing time to come. Remember, we live in an incredible world of beauty, amazing things, up and around us all the time. Because we awaken every day, into the awakening. Thank you so much. We want to thank you all for coming out tonight. It�s been great to see you another time.